His Building Blocks: What's Up? This is just a random blog post to talk about recent happenings in our household. I got a haircut. 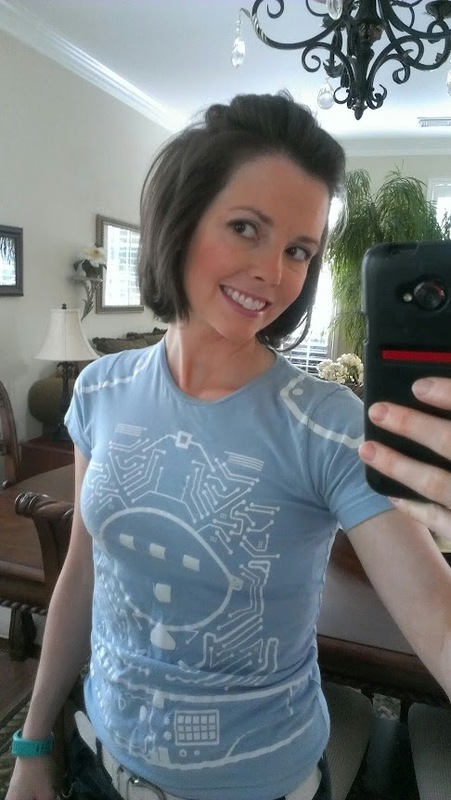 It is my second haircut since I began chemotherapy. My first haircut was last June. The hair stylist basically just cut off my mullet, evening up my hair into more of a "bob" style haircut. She also straightened it by blowing it with a hairdryer (I guess they call this a "blow-out"). My hair is normally very curly. This photo above is likely a rare occasion to see me in straight hair. It just takes WAY to long to make my hair straight. I am loving the weather lately. I have been trying to get out every day with the kids and soak up some Vitamin D via the sun. Also, the great rainfalls we have been having recently have really helped our garden. It is amazing to me how water from rain makes things grow and green up so much better than our man-made irrigation. Also, I am continually amazed by God's creation through the act of gardening. For example, a few weeks ago I planted sweet potato slips. One sweet potato can produce up to 50 slips, which can each be planted to yield 3 pounds of potatoes each. Isn't that cool? I love how cyclical it all is. 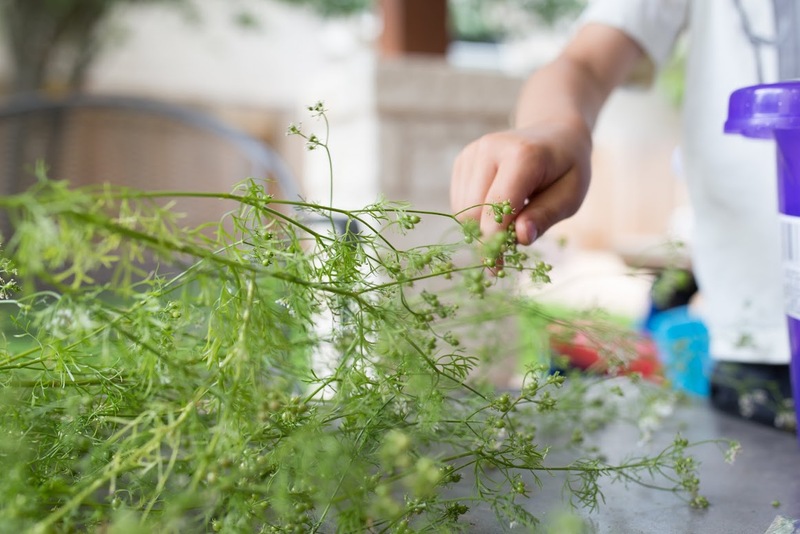 Earlier this season we planted some cilantro seeds, and we later really enjoyed eating the cilantro in various recipes. 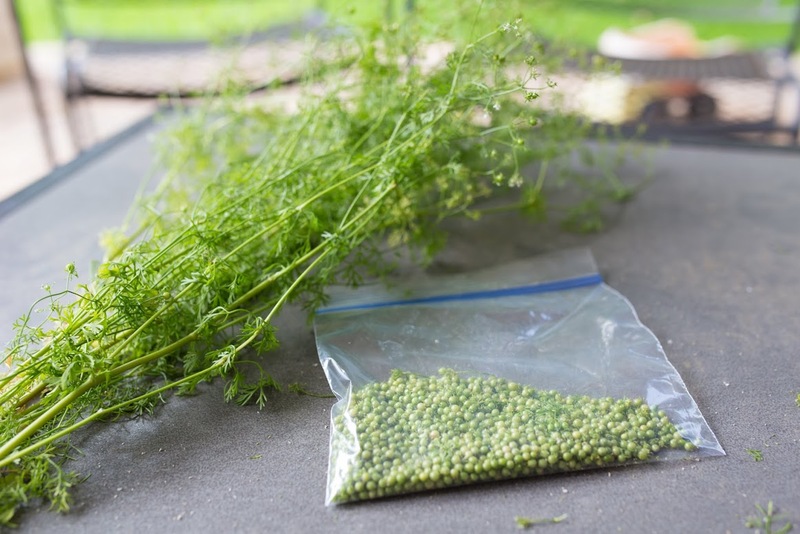 But, did you know you can let the cilantro bolt and turn to seed, which it does naturally when the weather becomes really warm. After it flowers, you just leave it in the garden until the flowers turn into little seeds. Those seeds are what we call "coriander seeds"! (The cilantro plant is actually called the "coriander plant" in a lot of other countries.) 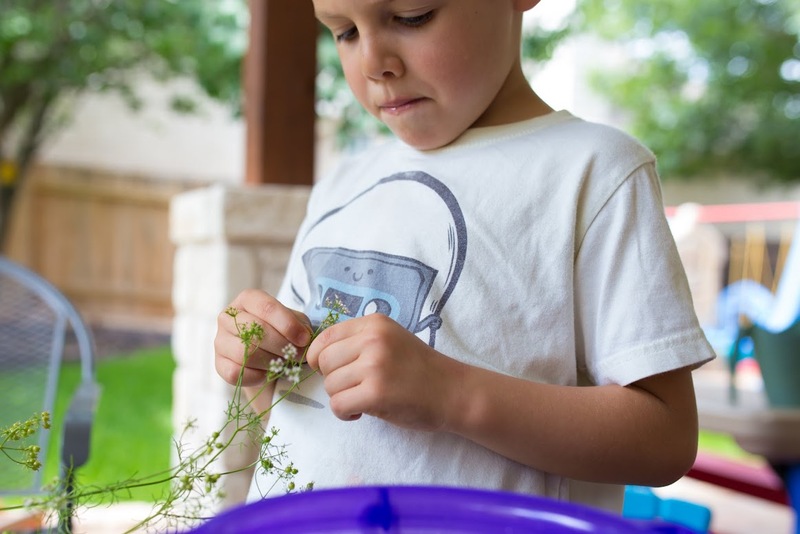 My little gardening buddy, Luke, helped me harvest our coriander seeds recently. It amazes me that this one cilantro/coriander plant produced TONS of seeds--each of which could be planted to produce new cilantro plants next season. A lot of folks wait until the seeds to brown to harvest them. But, I have read you can harvest them earlier and get more seeds. When they turn brown, a lot of them begin to fall off the plant. I plan on planting some of them next cilantro season and putting the rest in a pepper mill to use as a spice once dried. The seed has a plethora of health benefits. Drew: Drew has been super-busy with work lately. He works from about 7am-5pm. Then, he comes home and eats dinner and puts the kids to bed. After the kids are in bed, he gets back to work and works until the wee hours of the morning. Last night he was working until 2am. We are both super excited for this project he has been working on for the past year and a half or so to be complete. The goal date is 6/30. So, we can definitely see that light at the end of the tunnel. We will definitely have to celebrate on July 1! In the meantime, we try to plan lots of fun family adventures for each weekend, when he isn't working. In the second video, Luke was one of three kids receiving a special award for completing extra credit work. Abbey is exclaiming, "Yay, Luke!" very loudly in the video. She is a proud little sister. Also, the video is pretty shaky, because Abbey is attacking me while I am shooting the video. Luke is getting a kiss from Abbey here because he was saddened by an ant who was trying to bite his leg. 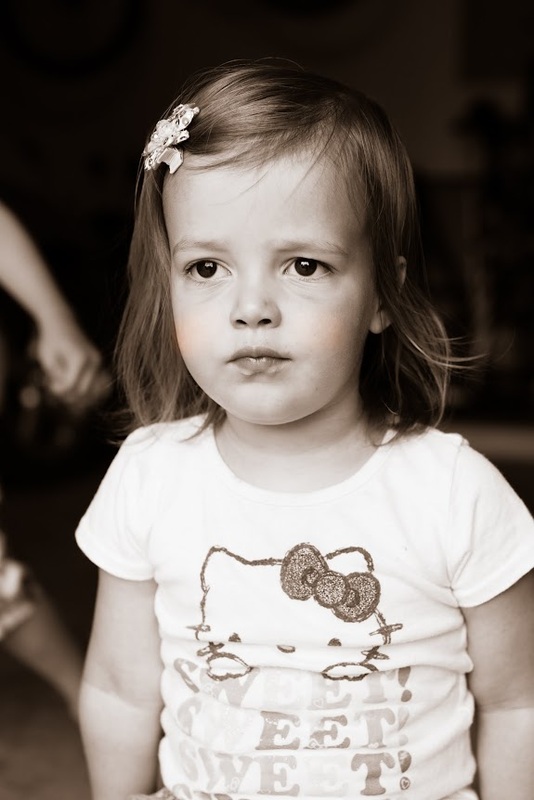 We are finding that Abbey is an ornery little girl! She is also one that picks up new skills at the speed of light. I've notice her learning curve is super-short. For example, she waited a few months longer than Luke did to walk, but when she started, she just started---no toddling around or anything. She just got up and started walking like she had been doing it for weeks. The same thing happened recently with potty training. I was bracing myself for some tough few weeks, even though we opted to use the 3 day potty training method again. I used it with Luke, and it was fabulous. Of course, he still had accidents periodically following the three days, but we still thought the method was effective. So, I covered our rugs with tarps, and started the potty training. 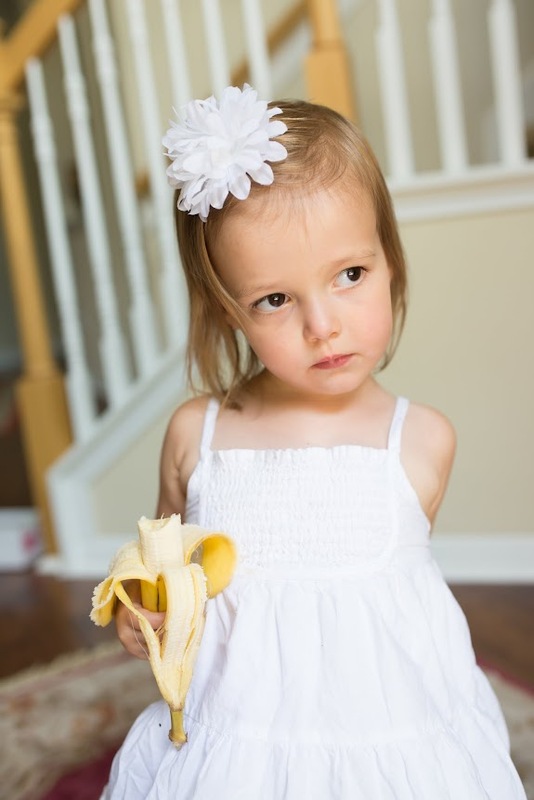 The three-day method is a "cold turkey" method of potty training. Once you decide to do it, you don't wear diapers any longer--only underwear. Well, Abbey was completely potty trained in 2 days! Perhaps that is normal for girls, but I am still amazed! I am sort of bracing myself for some type of regression, but it hasn't happened yet. She has been trained for over a month now. watching a recent rainfall from our open garage. I have also been hearing an excitedly exclaimed, "watch me, mommy," a lot from Abbey. She is pretty proud of all of her new big girl skills. She just recently started swinging in a "big kid swing" and thought it was cool stuff! Here is a little video of her first time swinging in the big girl swing for a long time.